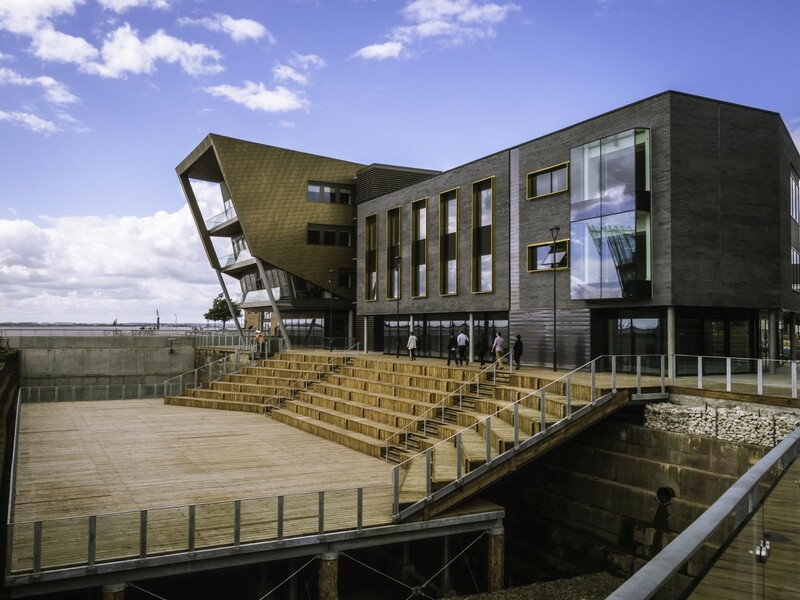 The latest Good Mark from Hull Civic Society has been awarded to the spectacular Centre for Digital Innovation (C4DI) together with the new amphitheatre, Stage@TheDock. Opened in December 2015, the £4m tech hub was designed as a powerful visual statement, using bold, contemporary materials which make reference to those used on The Deep to create a striking gateway to the River Hull. But the 23,000 sq ft building is much more than a design statement and landmark. C4DI has provided a powerful focal point for Hull’s previously disparate tech community and accelerated the growth of the region’s burgeoning digital sector. It has also been a major catalyst for the regeneration of the Fruit Market. Developed and funded by regeneration company Wykeland Group, with the assistance of a grant from the European Regional Development Fund, C4DI illustrates Wykeland’s innovative approach to delivering commercial development that creates value for the business and long-term benefits for the region’s economy. Wykeland had a vision to stimulate the growth of the digital economy in Hull by investing speculatively in a flagship for the tech sector. The company brought together KCOM, Sonoco Trident, the University of Hull and the Hull Digital network of tech specialists to realise the region’s ambitions. A two-year trial in a former bonded warehouse, also owned by Wykeland, proved the business model could work and provided Wykeland with the confidence to construct C4DI. Wykeland’s investment has given other companies the belief to invest in their own businesses, taking on additional staff and relocating to what is now a thriving hub of digital excellence. C4DI is close to fully let to a wide range of technology-based companies and also houses more than 230digital specialists and freelancers, all benefitting from KCOM’s ultrafast fibre broadband. C4DI has a clear mission – to help tech start-ups grow and big businesses innovate by using technology more efficiently. The fast-growing co-working community of digital specialists are developing projects for more than 30 member businesses, including global organisations such as Siemens and RB. C4DI is the spectacular centrepiece of Wykeland’s £15m @TheDock development, which also features two further, recently completed office buildings, one of which is already undergoing fit-out for an end user. @TheDock is completed by a unique amphitheatre created within Hull’s historic Central Dry Dock – the only new permanent venue built before Hull’s City of Culture year in 2017. Stage@TheDock opened this summer and was a key location during both the Humber Street Sesh and Freedom Festival and also hosted the Hull and East Yorkshire Digital Awards. It will be a showpiece venue during Hull’s year as the UK’s cultural capital. For the Civic Society it is so refreshing to see a building which sets a high standard of modern design and where the public realm works around the building are of an equal standard and are so attractive and welcoming to the public. It is proving to be a huge stimulus to the regeneration of the former Fruit Market, for which Hull has been crying out for so long. The Civic Society Good Mark was presented at a reception held at Silvers bar and restaurant in Silver Street, Hull, with Wykeland represented by Stephen Hudson, Development Director, and Tom Cannon, Project Manager. Mr Hudson said: “We’re delighted to receive this award, which recognises our commitment to creating workplaces of the highest quality where businesses thrive and employees are inspired. “The success of C4DI has justified our investment in creating a hub to stimulate the region’s digital technology sector. The building is a flagship and focal point for the digital economy locally and has become a place where tech specialists and major businesses collaborate and innovate.